Alchemy Quest: Lead, NW Caching TB Race and a New Cache! Over the weekend, we’d picked up PopUpPirate’s NW Caching TB Racer, so decided we would pop over to our Alchemy Quest: Lead cache today as it was one of the 15 caches the TB needed to visit. I had a lovely walk up to the cache, through absolutely deserted woods with only birdsong for company. This is what caching is all about – what a beautiful place. I was soon at GZ and found the cache well hidden. After taking some photos of the TB with the cache, I headed back to explore an interesting area of the woods I’d seen on my way up here. 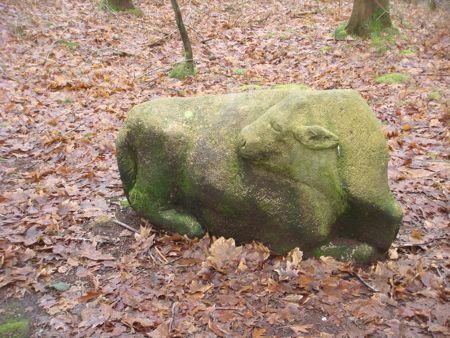 There are four long-forgotten statues of farm animals just sat amongst the trees, not far from the path. What an unusual, but really special place. I had a spare cache in my back-pack so set about finding a nice spot for it, taking lots of photos and getting a good co-ord reading for the cache. We spent the next few days, on and off, fine-tuning the cache page, before submitting it for review. Deceangi was on usual form and the cache was published in the blink of an eye. Last week’s Plan B became this week’s Plan A so it was off to just by the side of Bolton town centre to try the new series in Leverhulme Park and beyond. We soon arrived and parked up on the road at the northern end of the trail. We’d have a look on Google Earth and it all looked bike-able, so out the bikes came from the Jeep. The first couple of caches were really easy, including one called something like ‘Sit Down’, where there was only one bench anywhere near GZ. It does not get any easier than that! After that, it was down the hill to the road at the end and then a back-track along the riverside to the Large sized cache on the trail. We had to walk the plank over a stream to get to this one, which we both enjoyed. Great to see a HUGE box for the cache too! On returning to the bikes, it was clear I’d picked up a fast puncture in my back tyre. Drat! 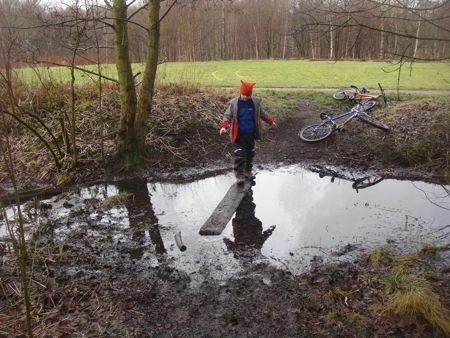 We did not have the repair kit with us so we’d have to walk the rest of the trail, pushing the bikes. The rest of the trail was uneventful, apart from a really nice hide at ‘Red or Grey’. I bet you can guess what animal the cache container looked like ;-). We then headed off to Ramsbottom, picking up 4 previous DNF’s on the way. Very satisfying to clear up DNF’s. 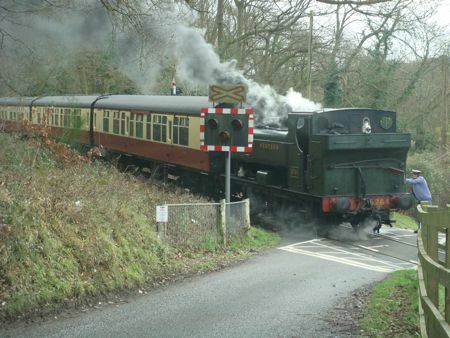 In Ramsbotton we were treated to a steam train puffing it’s way past us as we found the Sidetracked cache there. Next, we got a very unexpected FTF on a new cache by the river. Good stuff! A few more caches and we headed off towards the M60 and the new River Irk series. By the time we arrived, it was starting to get dark so we headed off with torches in our back-pack, just in case. Lots of easy finds here, apart from the second cache which we later found out had been un-published and retrieved by the owner, so it was no wonder we could not find it! Apparently it involved a new screw being put in a tree, so we can understand why it was un-published. All too soon it was dark and we’d completed the series, so set off for home as we were right by the M60 (handy planning that ;-)). On the way home, we got off the M6 at Sandbach to find a cache we’d DNF’d last weekend (it had been put back by a cacher some distance from where the GPS was telling us it was). 34 finds for the day. I was just finishing up work for the day yesterday when a notification email for a new cache a few miles from home popped into my Inbox. This does not happen that often so I just *had* to dash out and find it. I was at GZ within 15 minutes of publication and found the ammo box in the second place I looked. I was amazed to see we’d been beaten to FTF by someone. When I got home I saw they had been out to find the cache, found it, gone back home, written their log and posted it, all within 14 minutes of the publication of the cache. That’s some going! Anyway, it’s a great location that I’ve been meaning to explore but never quite got round to. The nearby old quarry wall with all the quartz crystals would make an excellent Earthcache too. We were off to see my sister’s new baby in Altrincham today so decided to set off a bit early and try for some newer caches in the area on the way. In particular, we had our eye on the new The Sparrow Boys caches around Dunham Massey as they have been getting great logs. We started off with 4 easy caches around the canal and old railway line in Lymm before moving on to the sneaky Sparrow Boys caches. The first one was the best hide we’ve seen in ages. We got lucky and spotted it immediately but some of the logs have had others searching for quite some time before finding it. That gave us the co-ords to the bonus cache, which was a nice easy Regular sized container. We only had time for one more of these caches before we were due at my sister’s, but it was another fantastic hide in a place we’d already checked several times. Can’t wait to come back and find the other caches round here. 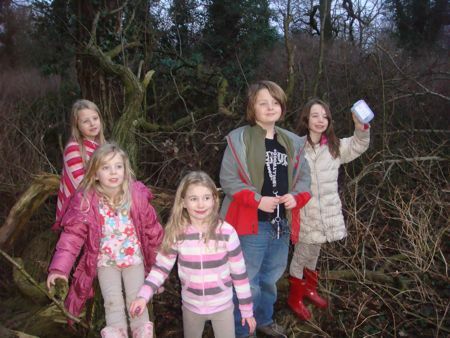 At my sister’s, I mentioned there was a cache really close to them, so the cousins and dogs set off to find it. It had only had one find, followed by a DNF so we did not hold out hope of finding it, but find it we did :-). On the way home. we had a DNF on a new cache on a motorway bridge near Sandbach. The cache owner has subsequently checked on it and the cache is indeed missing. We then did a quick Staffs Chuch Gem in Tittensor, just south of Stoke and a drive-by in Swynnerton Woods, not far from M6 J15. 10 finds for us today and a really nice day out for everyone. We could not decide where to go caching this week as it was a tie between South Shropshire and Bolton / Rawtenstall. In the end we opted for South Shropshire. We started off on a nice little series based along the River Rea between Cleobury Mortimer and Neene Savage. Some absolutely fabulous locations and stunning views. The only thing missing on this series was all the caches were micros, hidden in zip-lock bags and most we could see as we walked up. Most of the locations could have taken a big ammo box so we were bemused why they were all micros. After that, we did the remaining three Cleobury Country Wanderings caches. The first one was a nightmare to get to as what we thought was a badly marked PF was in fact private land and we’d totally missed the correct path. The second one was our favourite cache of the day – the only Regular sized cache, a nice walk and some great views over the whole area from GZ. After some soup and sandwiches, we set off to get the final two station pictures to bag the Severn Virtual Reward virtual cache. To log this, you have to post photos of you with your GPS at 7 of the stations along the Severn Valley Railway. We’d already got 5 of the photos from previous trips so it was a simple matter of finding two more stations for pictures. After we’d done the last one, we were treated to a train chuffing it’s way past the level crossing we were waiting at :-). We’d wasted a whole lot of time coming through Bewdley and Kidderminster so time was now getting on and we had quite a lot of caches left on the hit-list for the day. Next stop was the new HawkWalks caches near Stourbridge. On the way down the canal towpath to the second one, we bumped into another cacher – Dice Man. Great to meet you! The rest of the series was un-eventful apart from catching sight of the farmhouse that the unfortunate paper-boy, Carl Bridgewater was murdered at 20 or more years ago, when he disturbed burgulars. I remember having nightmares about this at the time as I was about the same age as Carl then. We then headed off into the centre of Stourbridge to look at the Stourbridge Trek series. The first one was nowhere to be seen and the cache page implied the cache was “within 150ft of the stated co-ordinates”, despite a Traditional cache being meant to be hidden *at* the stated co-ords. We gave up and left the rest of the series for another day, just in case they were all as confusing as the first one. We started to head towards home as it was dark by now, but not before stopping off in Wolverhampton to bag 4 newer caches. 22 finds in total, which was a bit deflating, given the amount of effort we’ve put in today. The time spend crossing Kidderminster and getting the two station pictures really took it’s toll on the find count. During the week we’d seen the January Jovialities series come out to the SE of Brum and were intrigued. All the more so because the whole series deliberately did not have any hints on the caches, which sounded like a fun challenge. The series started off easily enough with a quick find at number 1. Next was a DNF at number 2 (we returned after completing the rest of the caches to find this one). The rest of the series was easy apart from a couple of caches, but we persevered and got them all found in the end. At one point a whole group of us used a PAF to the cache owner, who turned up on-site 15 minutes later with a replacement cache, as the original had slid too far into it’s hiding place to get at. 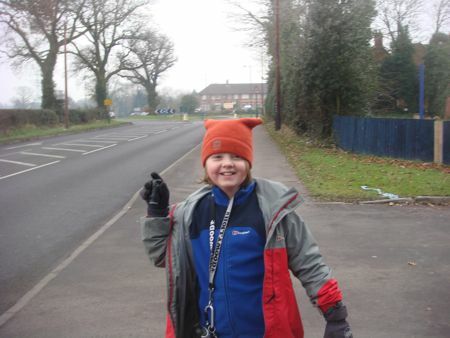 After that, we set off towards the M40 junction to find some caches around Dorridge before the trip home. Not a lot more to report apart from a right laugh at Busy Busy Train Spotting when we read from the clue that the cache was magnetic and then found it sneakily hidden on something you would not normally think is magnetic. Nice one! To finish the day off, we set off to finally find the Shelley Coppice cache, along with the other two caches along the same path, one belonging to our friends The Pirates Of Shropshire. We’ve been meaning to do this one for ages so it was great to finally be able to tick it off the list. 30 finds in total and a great day with lots of geo-chats with the many cachers we bumped into. We’d just got back from a great day out caching around Wrexham and Chester on Saturday night when up popped 9 new local caches. Unfortunately we were still warming up from the day out so did not want to dash out into the cold again and we had family commitments the next day so no chance of going to find the caches then. 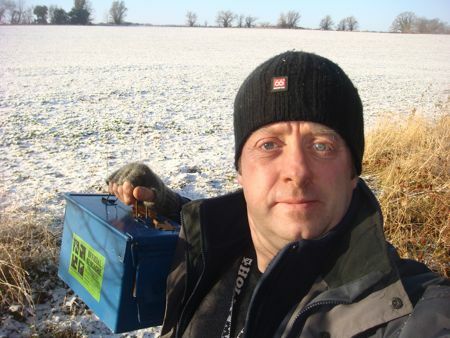 Monday morning arrived and it was a crisp, clear, but very cold day – perfect for geocaching. I set off and tackled a series of 4 along a Public Footpath to the south of Shrewsbury first. I could not spot the first one quickly so went off to find the others and came back for an easy find in a place I’d not thought to look – doh! After that, there was another new one about 0.35 away down another bridleway which no-one had logged yet. Could I be in with a chance of a FTF? I was soon at GZ and looked all over the bridge but could not spot the nano. I was wondering about two words in the hint and what the cache owner meant with it and decided to try another tack. Sure enough, I was right and there the cache was, hidden in a place I’d not thought to look before. Even better, I was FTF :-). After that, it was a short drive down to Cound and four more caches, including two at a Nature Reserve I did not know existed, despite driving past the other side of the hedge on the main road many times. A very satisfying couple of hours and 9 finds to boot.